Pregnancy is a wonderful and rewarding experience for most women. However, the female body experiences a number of dramatic physical changes during pregnancy that can lead to considerable discomfort. Our Clear Chiropractic doctors want you to know how beneficial chiropractic treatments can be to help soothe the aches and pains involved in pregnancy, so you can get back to focusing on what a truly wonderful miracle it is. There are number of common symptoms that occur through the various stages. Pregnancy is usually divided chronologically into trimesters. From conception to the beginning of the fourth month, most pregnancy symptoms relate to the hormonal cascade that occurs in the expectant mom’s body. During the first trimester, it’s usual for her to suffer morning sickness, water retention and/or bloating. For some women, the fluctuating hormones may trigger headaches. In addition to the biochemical changes, there is often a high degree of emotional stress associated with such a life changing event. Many women report mood swings and this can result in more muscle tension. Since taking medication is not recommended for pregnant or lactating women, chiropractic is an excellent pain relief alternative. Research proves chiropractic to be a safe and effective method for alleviating some of the symptoms that appear during the first trimester of pregnancy. This is the phase where the greatest weight gain occurs. With the abdominal region accumulating most of the extra pounds, the center of gravity for a pregnant woman shifts forward. This places increased postural stress on the muscles of the lower back and pelvis, often causing the lumbar spine to increase its natural arch. This may increase pain and soreness. Recent evidence reveals up to 69% of pregnant women suffer from low back pain. Fortunately, chiropractic adjustments are excellent for pregnant patients with lower back problems. Given the rapid weight gain experienced during the second trimester will be carried for the final three months, the third trimester is usually the time when most musculoskeletal symptoms occur. Lower back pain becomes more common during this time. A large number of these cases are due to sacroiliac joint irritation. In one study, seven out of ten women reported significant benefit from having spinal manipulation in this area to alleviate their lower back pain. Not only are postural changes more of a problem during this phase, a pregnant woman’s breasts enlarge in preparation for feeding the newborn. As a result, shoulders tend to round forward, and the upper back area may feel stress and strain. Further hormonal changes also occur during the third trimester. The hormone relaxin is released into the pregnant mom’s bloodstream to help promote greater flexibility of the ligaments and tendons surrounding the joints. This is a crucial function when she undergoes delivery. However, this function can also create dysfunction. As ligaments loosen, joints become more prone to subluxate. With some of the greatest mechanical loads being placed on the pelvis just before birth, the sacroiliac joints in the pelvic area can easily shift. Corrective adjustment from a chiropractor is all that a pregnant woman needs to re-establish proper movement and function in the pelvis and joints. Can Chiropractors Help with Breech Babies? 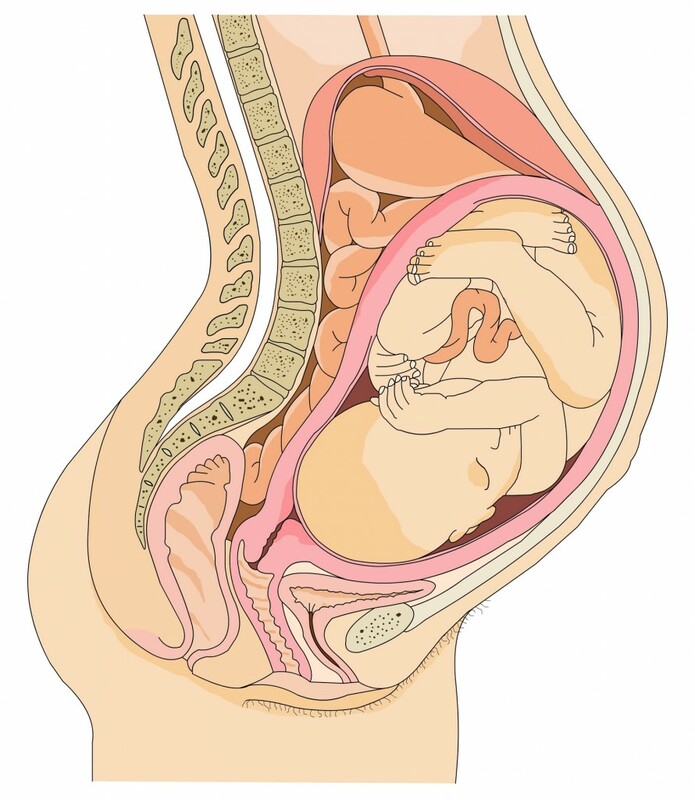 A baby is considered to be in breech position when his or her feet are in position to emerge first during delivery. This poses a greater risk for both mother and child. Chiropractors may be able to remedy this situation. Several years ago, Dr. Larry Webster, a chiropractor, developed a technique to help reposition babies in utero with only a few minor adjustments. The Journal of Manipulative and Physiological Therapeutics reported an 82% success rate of babies turning head-down when doctors of chiropractic used the Webster Technique. Chiropractic care, delivered at any stage of pregnancy, can lead to reduced stress and strain on joints, nerves and muscles. The final product is a happy and healthier mom-to-be. If you’re expecting, don’t wait until the pain hits to come see a chiropractor, get in early and we’ll help you get through all three timesters as comfortably and healthy as possible! 1. Dabbs V, Lauretti WJ. A risk assessment of cervical manipulation vs NSAIDs for the treatment of J Manipulative Physiol Ther 1996; 18(8): 530-536. 2. Vernon HT. The effectiveness of chiropractic manipulation in the treatment of headache: an exploration in the literature. J Manipulative Physiol Ther 1995; 18(9): 611-617. 4. Lisi, AJ. Chiropractic spinal manipulation for low back pain of pregnancy: A retrospective case series. Journal of Midwifery & Women’s Health 2006; 5(1): e7-e10. 5. Meade TW et al. Low back pain of mechanical origin: randomized comparison of chiropractic and hospital outpatient treatment. BMJ 1990; 300 (6737): 1431-1437. 7. Borggren CL. 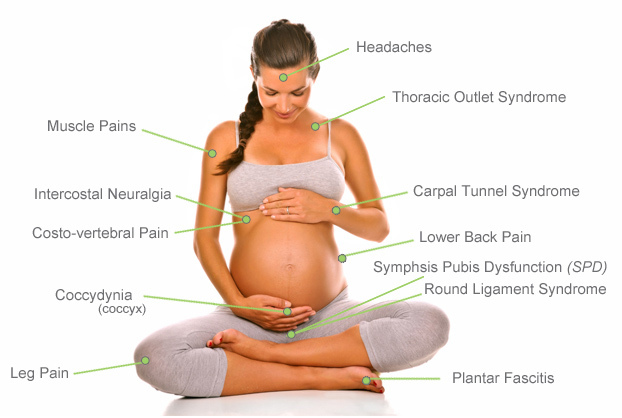 Pregnancy and chiropractic: a narrative review of the literature. Journal of Chiropractic Medicine (JMC) 2007; 6(2): 70-74. 8. Berv G et al. Low back pain during pregnancy. Obstet and Gynecol 1988; 72: 71-75. 9. Daly JM, Frame PS, Rapoza PA. Sacroiliac subluxation: a common treatable cause of low back pain in pregnancy. Fam Prac Res J 1991; 11(2): 149-159. 10. Pistolese R. The Webster Techniqu: A chiropractic technique with obstetric implications. JMPT 2002; 25(6): e1-e9.